We have already discussed GSTR-1 which contains details of all sales and GSTR-2 which the details of purchases. Now we will discuss GSTR-3 which will contain the monthly summary of sales and purchases along with the tax liability. What happens if GSTR-3 is not filed? What happens if GSTR-3 is filed late? How will GSTR-3 and GSTR-3B be reconciled? GSTR-3 is a monthly return with the summarized details of sales, purchases, sales during the month along with the amount of GST liability. This return is auto-generated pulling information from GSTR-1 and GSTR-2. 2. Why is GSTR-3 important? GSTR-3 will show the amount of GST liability for the month. The taxpayer must pay the tax and file the return. 3. When is GSTR-3 due? Businesses with annual turnover up to 1.5 crores will submit quarterly returns. Taxes will be paid quarterly. Due dates of Aug & Sep will be declared later. Due Date for Filing GSTR-3 is 20th of next month. There is a 5-day gap between GSTR-2 & GSTR-3 filing to correct any errors and discrepancies. For business’ with turnover less than 1.5 crores, quarterly returns are applicable whose due dates will be announced later. 4. What happens if GSTR-3 is not filed? If GSTR-3 return is not filed then the GSTR-1 of the next month cannot be filed. Hence, late filing of GST return will have a cascading effect leading to heavy fines and penalty. 5. What happens if GSTR-3 is filed late? If you delay in filing, you will be liable to pay interest and a late fee. Interest is 18% per annum. It has to be calculated by the tax payer on the amount of outstanding tax to be paid. Time period will be from the next day of filing (16th of the month) to the date of payment. Late fee is Rs. 100 per day per Act. So it is 100 under CGST & 100 under SGST. Total will be Rs. 200/day. Maximum is Rs. 5,000.There is no late fee on IGST. 6. Who should file GSTR-3? Every registered person is required to file GSTR-3 irrespective of whether there are any transactions during the month or not. 7. How to revise GSTR-3? GSTR-3 once filed cannot be revised. Any mistake made in the return can be revised in the next month’s GSTR-1 and GSTR-2 returns. Direct revision in GSTR-3 is not possible as GSTR-3 is auto-generated without provision for editing. 8. How will GSTR-3 and GSTR-3B be reconciled? GSTR 3B is a simple return form introduced by the CBEC for the month of July and August 2017. GSTR-3 will also have to be filed for July & August 2017. On filing the GSTR 3, if actual liabilities are different from those declared in GSTR 3B, the system will update the (difference) between GSTR 3B and GSTR 3 automatically. In case, actual liabilities in GSTR-3 are higher than those declared and paid with GSTR-3B, you will have to pay the extra amount tax along with interest on the extra amount. GSTR-3 must be filed only after paying entire tax liability otherwise it will not be treated as valid return. If taxpayer has filed an invalid return and later on he wants to pay the remaining liability then he has to file the Part B of GSTR-3 again. There are 15 headings in GSTR-3 format prescribed by the government. We have explained each heading along with the details required to be reported under GSTR-3. Month, Year – Mention the relevant month and year for which GSTR-3 is being filed. There are 2 parts of GSTR-3. 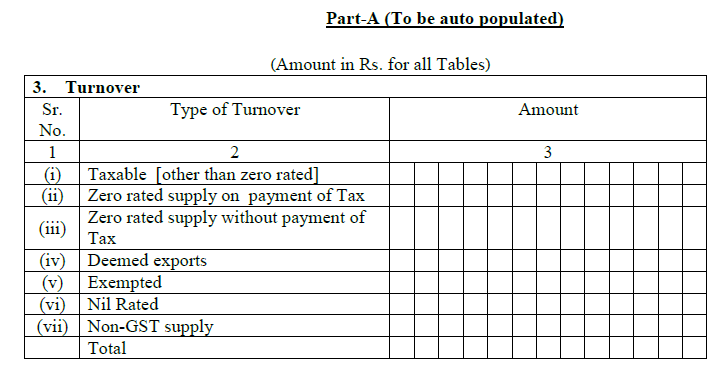 Part A is auto-populated from GSTR-1, GSTR-1A & GSTR-2 and Part B must be filled up manually. (i) Taxable Turnover [other than zero rated]: This includes the normal sales to both registered and unregistered buyers. 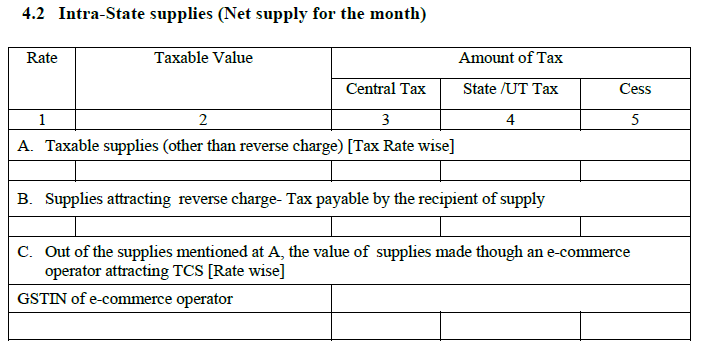 (iii) Zero rated supply without payment of tax: This will include exports which are paid with bond/LUT. (v) Exempted: These are goods/services which do not attract GST. (vi) Nil Rated: These are goods/services which attract 0% GST. (vii) Non-GST supply: These are items like petrol, electricity which are outside the scope of GST. This heading will contain summary of all your sales during the month. The information will be pulled automatically from your GSTR-1. 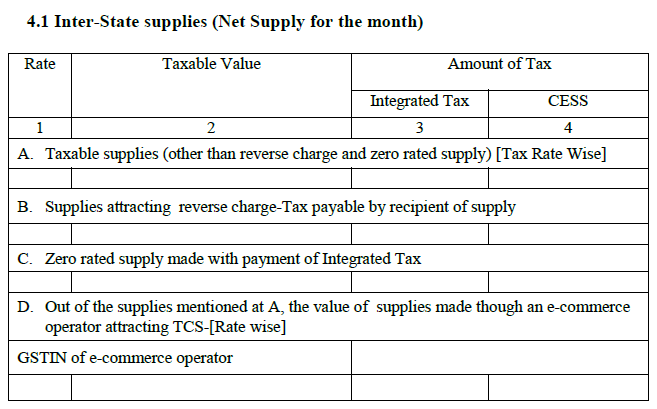 D. Out of the supplies mentioned at A, the value of supplies made though an e-commerce operator attracting TCS-[Rate wise]: This will contain the portion of sales made through e-commerce (point A has the total sales including e-commerce sales). GSTIN of e-commerce operator will also be displayed. Zero rated supplies made without payment of taxes, i.e., exports through bond/LUT will not be included. 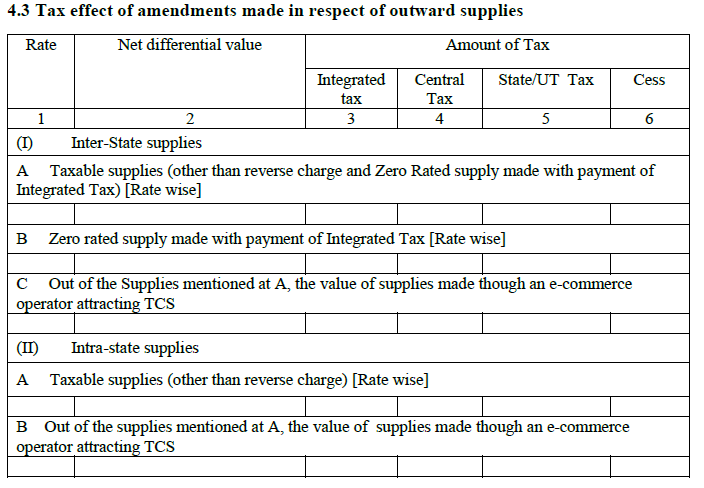 Amendments of supplies originally made under reverse charge basis will not be included in Table 4. This is similar to above heading except that this will contain details of intra-state sales. This will contain the changes made to your sales invoice. If the amount is changed, the amount of ITC to claim also changes which impacts the tax payable to the government. It may result in excess or under payment. The information under this heading helps to keep track of invoices on which changes have been made and the impact of the change on the tax amount. This heading will contain your purchases during the month and supplies you received during this month. The information will be pulled automatically from your using the data that you have recorded under the GSTR-2. This will contain the changes made to your purchases which attract reverse charge. If the amount is changed, the amount of ITC also changes which changes the tax payable. It may result in excess or under payment. The information under this heading helps to keep track of invoices on which changes have been made and the impact of the change on the tax amount. ITC received from Input Service Distributor (ISD) will also be shown here. All ITC will be shown after adjusting debit/credit notes. This part will contain changes made to earlier month’s details and their effect on ITC. This heading will contain the mismatches in ITC and tax liability between the original returns and any changes filed during the current month. This information will be sourced from GSTR-2. a. ITC claimed on mismatched or duplication of invoices or debit notes: In case mismatch of invoices, there may be double claiming of ITC. The excess ITC claimed from duplicate purchase invoices will be reversed and added to the tax liability. b. Tax liability on mismatched credit notes: Incorrect credit notes issued by you will also result in incorrect ITC. Extra ITC claimed due to mismatch will now be added to your tax liability. c. Reclaim on rectification of mismatched invoices/Debit Notes: This is the opposite of point (a). In this case, mismatch has led to claiming lower ITC. You are entitled to more ITC and so the additional amount will be reduced from the output tax liability. 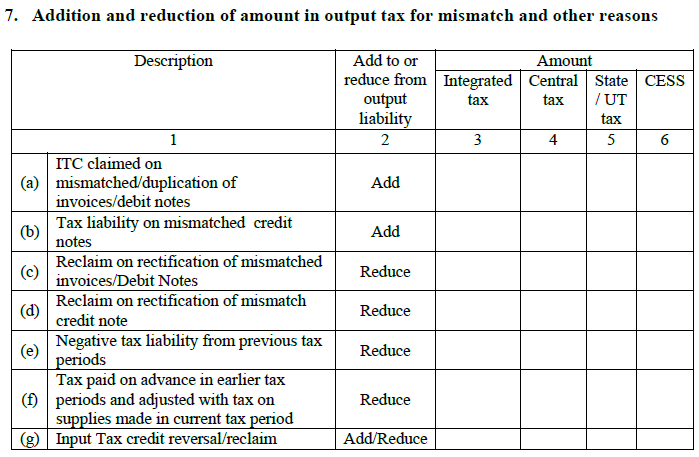 d. Reclaim on rectification of mismatch credit note: (Reduce): This is opposite to (b), i.e., lower ITC has been claimed and will work in the same way as (c). e. Negative tax liability from previous tax periods: This is due to excess tax paid during the previous months and will be reduced from output tax liability of this month. f. Tax paid on advance in earlier tax periods and adjusted with tax on supplies made in current tax period. This refers to tax paid along with advance payments in earlier months for supplies received during this month. 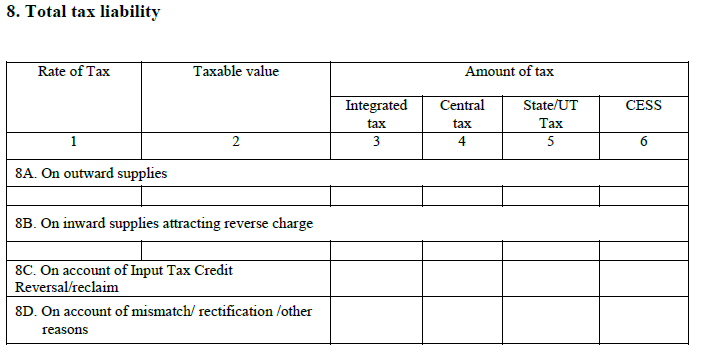 g. Input Tax credit reversal/reclaim: This refers to ITC being reversed or reclaimed due to any other reason. 8A. On outward supplies: This is tax payable on your normal sales including inter-state sales. 8B. 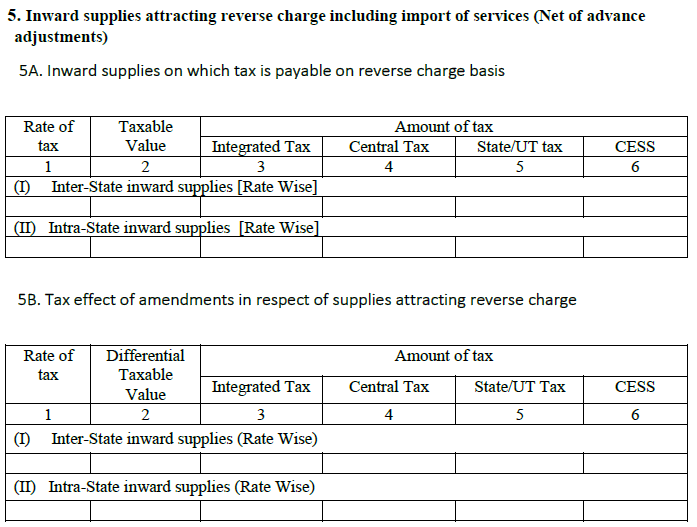 On inward supplies under reverse charge: This is the tax payable on purchases attracting reverse charge. 8C. On account of ITC reversal or reclaim: This is the additional tax payable/or reduction available due to ITC reversal or reclaim. The information flows from Table 11 of GSTR-2. 8D. On account of mismatch/ rectification /other reasons: This will include tax liability due to any other reason. This heading will contain the details of TDS and TCS paid by you. The amounts of TDS/TCS will be deducted from the total liability to arrive at net tax amount you must pay. Interest is applicable on delay of payment. Interest is 18% per annum. It has to be calculated by the tax payer on the amount of outstanding tax to be paid. Time period will be from the next day of filing (20th of the month) to the date of payment. This heading shows the reason and the amount of interest applicable. Breakup into CGST, SGST, IGST & Cess will be given. ITC claimed on mismatch invoice: Your tax liability has increased due to a change in purchase invoice and ITC was claimed on such invoice. You must pay interest on the increased amount. On account of other ITC reversal: Your ITC claimed was reversed which has increased your tax liability and so interest is payable. 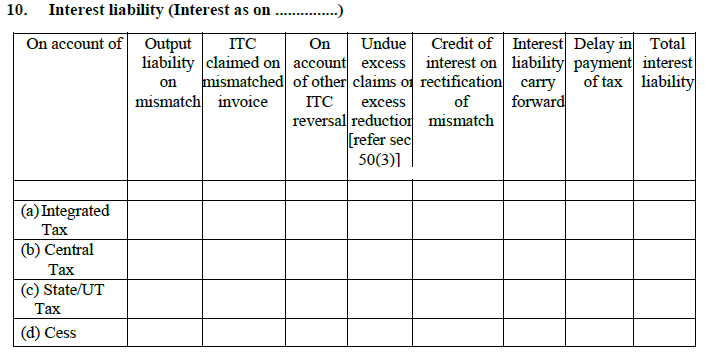 Credit of interest on rectification of mismatch: You had paid interest on mismatch and now the interest is reversed or credited back. Interest liability carry forward: You had an interest liability which you have paid partly. The balance amount will be carried forward. Delay in payment of tax: This is due to late payment/ late filing of return. Total interest liability: Finally, it will show the total interest payable under CGST, SGST & IGST. A late fee is alco applicable along with interest on delayed return filing. Late fee is Rs. 100 per day. Maximum is Rs. 5,000. Note: There is no late fee for IGST. You will fill up the appropriate columns with the appropriate amounts. For example, if you have a tax liability of Rs. 30,000 and ITC of Rs. 10,000, you can opt to pay Rs. 20,000 in cash (fill up col 3) and Rs. 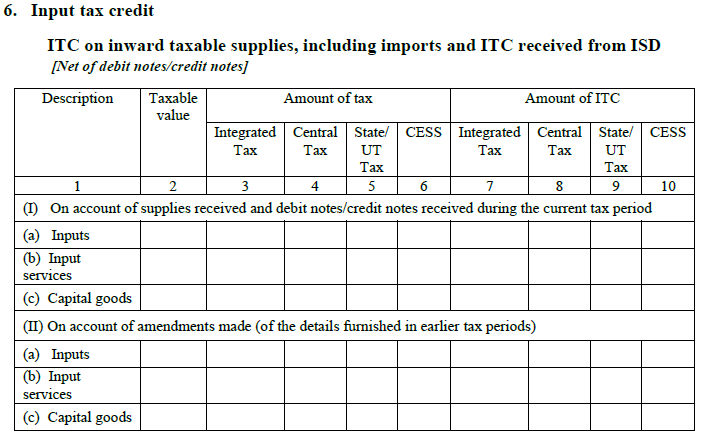 10,000 through ITC (fill up the appropriate columns under 4,5,6. Remember to follow the ITC claim rules. Here, you will fill in the amount payable and the amount paid under interest, late fee with the breakup of tax heads. If it is found that the tax paid is higher than the actual amount then the difference will be refunded to you. Refund from cash ledger can only be claimed only when all return related liabilities for the month have been discharged. Refund claimed Table 14 will result in a debit entry in electronic cash ledger on filing of valid GSTR 3. This section will be automatically filled in when you pay taxes and submit your returns. Finally sign off with a declaration that all information has been supplied and is correct. To know more about the different types of returns, deadlines and the frequency of filing, read our article on GST Returns. File your GSTR-2 Returns using the ClearTax GST Software. You can now create GST compliant invoices for FREE on ClearTax BillBook.